Amino acids have an amino group bonded to a carbon skeleton. 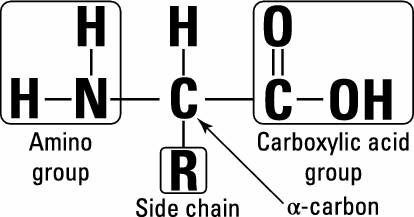 Each amino acid has one or more special side groups or chains (R) that give it a specific structure or function. Making amino acids from scratch is very expensive in terms of energy, so microbes try their best to get them from their environment. When they can’t get them from outside, however, they use a kind of template method to reduce the amount of energy spent on different biosynthesis pathways. Amino acid biosynthesis starts with a carbon skeleton, made from intermediates of the citric acid cycle or glycolysis. A few different skeletons can be used in the production of several different amino acids, and what you get are classes of amino acids where the members of each class have a similar structure. Glutamate dehydrogenase: Used when NH3 is plentiful. It’s the less energy expensive of the two. Glutamate synthase: Used in NH3-poor conditions. It requires more energy than glutamate dehydrogenase. Here’s the second frugal thing that microbes do: After glutamine and glutamate are made, the amino group can be used in all the other 20 amino acids. Nucleotides are the subunits of nucleic acids like ribonucleic acid (RNA) and deoxyribonucleic acid (DNA), and like amino acids they’re expensive and time consuming to make. In fact, nucleotides are even more cumbersome to make because atoms of carbon and nitrogen have to be added one at a time! When it can’t be avoided, microbes make two different nucleotide templates (one for purines and one for pyrimidines) that they modify to make other variants. This saves the expense of having a bunch of complex pathways for nucleotide biosynthesis at work in the cell. 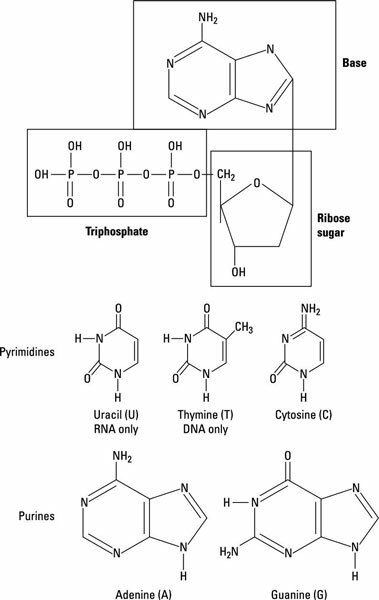 The two classes of nucleotides that arise are the purines and the pyrimidines. The first key purine made is inosinic acid, from all kinds of carbon and nitrogen sources. Once made, it’s modified to produce the main purines adenine and guanine. The first key pyrimidine made is uridylate, which is then modified into thyamine, cytosine, and uracil. The structure of complete nucleotides is shown here. They have a purine or pyrimidine ring attached to three phosphates (PO3–) and a ribose sugar backbone. After they’re formed, they can either be used directly in RNA or the ribose can be modified, by reduction to deoxyribose, and be used in DNA.